More than 130,000 people have already voted in Calgary's Olympic bid plebiscite. As of 1 p.m. on Tuesday, 76,204 people had voted in person, adding to the 46,620 advance votes and 7,990 mail-in ballots received, according to the city. In total, there have been 130,814 votes. During the 2017 election, 85,984 people had voted by 2 p.m., not including mail-ins and advance voting. The grand total at the end of last fall's election was 387,306. That was equal to a 58 per cent voter turnout, according to Elections Calgary. Calgarians have until 8 p.m. to cast their vote on the Olympic question. Voter Ron McCulloch, who cast his ballet at the Strathcona Christie Aspen Community Association, said he was basing his choice on his conscience and his pocketbook. "It's somewhat annoying that the city has given the Yes people a lot of money and they've given the No people nothing," he said. "And you kind of look and say, well, is this the elite that's pushing the agenda?" But voter Nina Connors said she hopes people realize it's about more than money. "I came to vote because I was in the Olympics in Vancouver and thought it was the most wonderful thing I've ever been to, and I think if anyone can do this, it's Calgary," she said. Mayor Naheed Nenshi said he just has one request for Calgarians — to vote. "Regardless of where you stand, let's make sure there's a really high voter turnout so there's an unambiguous decision on this," Nenshi said, who voted Tuesday morning at Monsignor A.J. Hetherington School in the northeast. "I hope you'll vote Yes. I think there are many great reasons to keep this process going and to not let this opportunity pass us by. But regardless of where you stand, please come out and vote." Many Calgarians across the city heard the mayor's voice in a robocall Monday night, pushing for a Yes vote. A plebiscite result in favour would likely mean the city's Olympic bid corporation would submit a formal proposal to the International Olympic Committee (IOC) in January, while a vote against would result in the province pulling its financial support and likely a council vote that would see the bid corporation shut down. Voting for the non-binding plebiscite takes place in all city wards and there are multiple polls in each ward. Elections Calgary said voters should not wear their Olympic gear to polling stations, as campaigning is not permitted inside. The advance polls drew a strong turnout, with 54,442 votes, including 8,582 mail-in ballots. 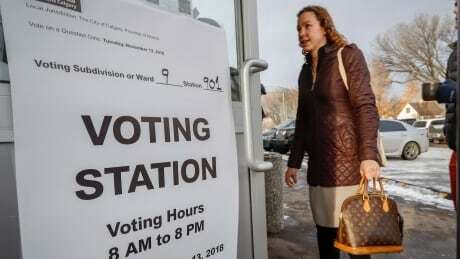 Updates on voter turnout will be provided by Elections Calgary throughout the day, with a single result being provided around 10 p.m. Tuesday evening. The plebiscite is the first time in a Calgary election that electronic vote tabulating machines will be used, instead of hand-counting ballots. Voters are required to provide some identification, which can be an identification card, bank or credit card statement, tax assessment notice, insurance policy or coverage card, or statement of government benefits. Passports are not valid as your ID. You must be 18, a Canadian citizen, a resident of Calgary and be a resident of Alberta for the six consecutive months prior to the vote. You do not have to register ahead of time. More information can be found on the Calgary Elections website.